Have you been keeping up with the reports out of New York and London's Fashion Week runway shows? The motifs, colors, styles and trends seen there will trickle their way through the retail landscape like a branching river, making their way to low, medium and high end stores. As it has for hundreds of years, embroidery is still trendy for embellishments. While many of us can't afford Alexander McQueen couture, we can add spots of stitching to our outfits and be right on trend. 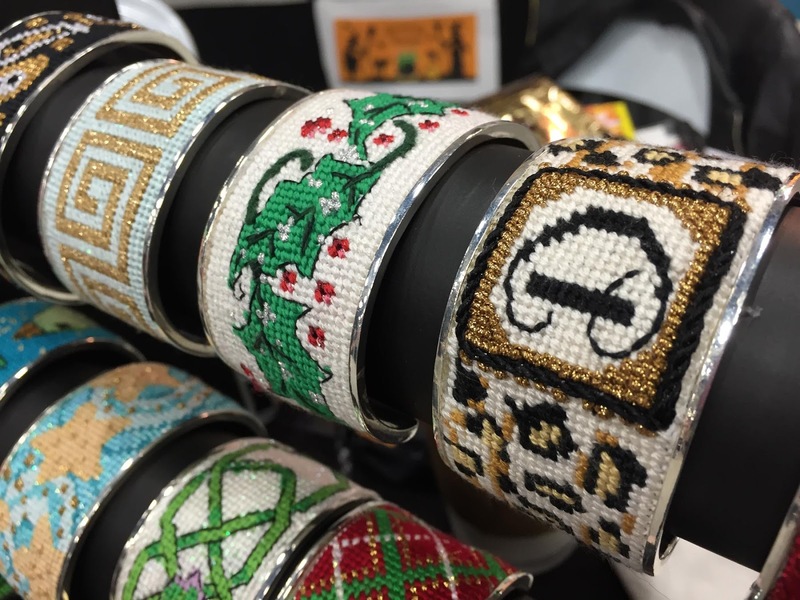 Start with these new needlepoint bracelets from Cheryl Schaeffer and Annie Lee Designs. While needlepointed jewelry cuffs aren't new, Cheryl and Annie's designs and silver bangle style are refreshing. 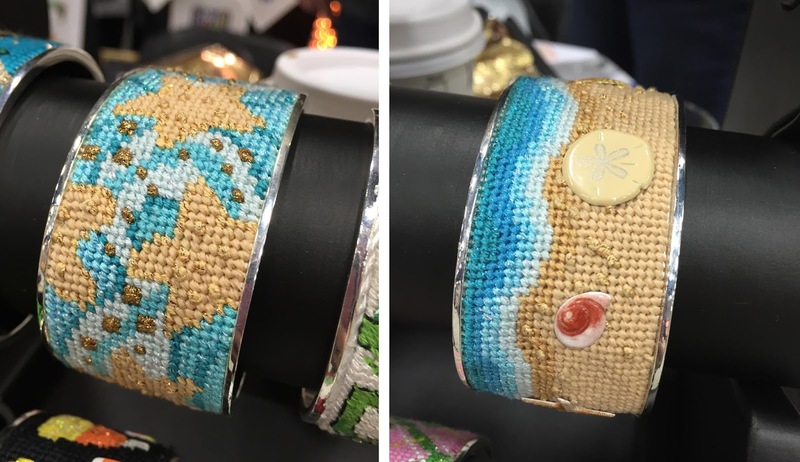 We spotted these at the TNNA tradeshow in January, and knew they'd be a hit: quick to stitch, easy finishing, and you get the bangle when you buy the painted canvas. Just add threads—with a spice or two of Kreinik metallics, of course. 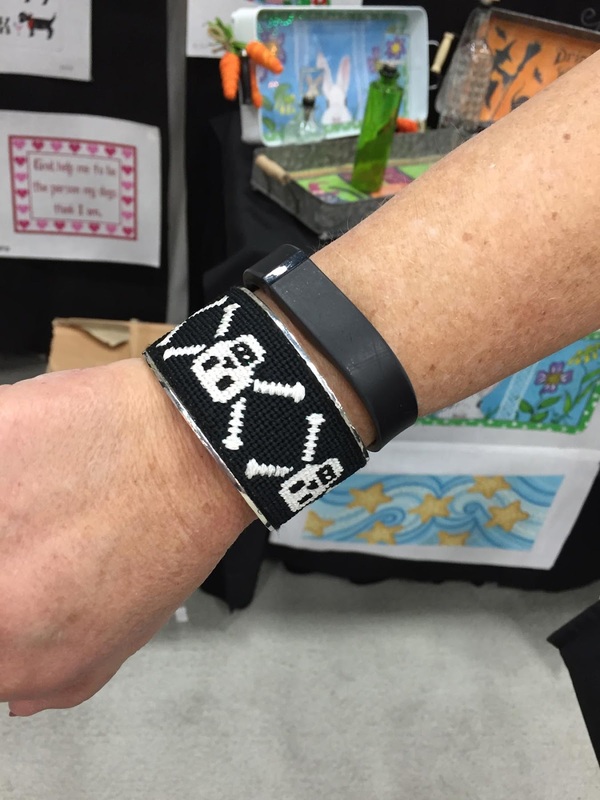 The designs would make great gifts for yourself or a friend. Take a look at the photos here to see a few of the design options. 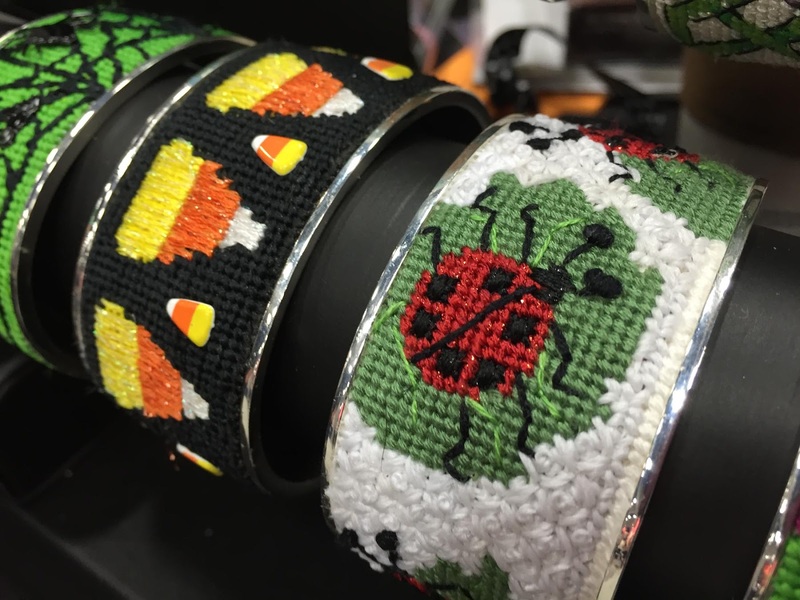 Ask your favorite needlepoint store to order them for you from Cheryl Schaeffer and Annie Lee Designs, http://www.cherylschaeffer.com/. When an email comes in asking for Bent Weaver's Needles for making horse saddle cinch makers, you can't help but do a double-take. We get a lot of needlework enquiries, but not often from the horse industry. Then you find out the business owner in interested in Kreinik threads for making dressings for horse riders, and you definitely want to know more. We interviewed business owner, Charlotte Sharkey, and she shared some fabulous photos. Settle in; it's an extensive chat, but pretty interesting. 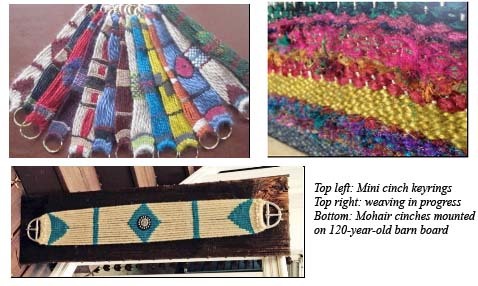 The lesson here: no matter what you make with needle and thread, it can be creative, useful and beautiful. Q: How did you get started in the horse business (making mohair, cinches, belts, etc)? A: I guess first we’d have to go back to how I got started with fiber. I designed and taught jewelry techniques for 20 years as a hobby, including making glass beads over a torch—that’s where I experimented with color, which has served me well. About 13 years ago I moved from San Francisco to a 13-acre farm in the New York area known as the Finger Lakes. I’m only 10 miles from Cornell University, but 4.5 hours away from NYC. My new home is where the ice cream sundae was invented, and the Moog Synthesizer. We even have a farm raising buffalo. It’s a pretty grass roots community. Since I moved to a farm I figured it should BE a farm. Didn’t want to raise meat, didn’t want to milk every day, so I turned to fiber. I started with Angora rabbits, joined the local hand-spinners guild and learned all about fiber from shearing to cleaning to spinning. Then dyeing, felting, weaving, crochet…it all followed. As did the alpaca boys and the Shetland sheep. And the ducks & chickens. Then I got my horse, Sweetie. Being a “maker,” I wanted control over creating some her tack. Somehow, while I was doing my research online I discovered a site that was all about weaving horse tack with mohair. Now, mohair is one of my favorite fibers. It’s considered the “diamond of fibers.” So I ordered a loom and a lot of mohair cinch cord. This is a special yarn made specifically for horse tack. Very difficult to acquire here in the U.S.. Nearly all mohair is milled in South Africa, the world’s largest producer of mohair. The color range I was able to get was interesting, but limited. The next thing I knew I was importing the mohair cord myself…and buying dyes, and pot to dye in, and all the other things ones needs. Q: How do you use Bent Weaver's Needles? A: The instructional video I learned how to weave the cinches from illustrated how to weave in the mohair ends—using forceps! I still cannot understand why. I already had some Bent-tip Weaver needles carried by Kreinik and instantly knew this was a MUCH better method. Why is this type of needle preferred to a straight needle? Because the cinches are woven very tightly. You want to know exactly where your needle is and where it’s going to come out. The Bent tip allows this. Plus, the fact that it’s stainless steel means you can actually grab it with a pair of needle-nose pliers & pull it through without the pliers nicking the needle shaft, causing rough spots, as would happen with an aluminum bent-tip needle. This is critical in order to smoothly weave in the mohair ends. Not to mention that I’ve had an aluminum needle head break while trying to pull it through with pliers—something the stainless steel needles won’t ever do. 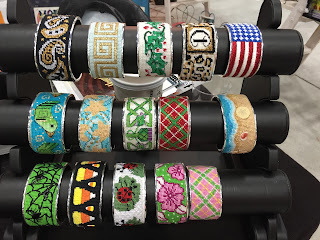 Q: What role does color play in making dressing for horses, riders, etc? A: The Western horse riding crowd in our U.S. Western states do more than just ride their horses for pleasure. They also compete in all types of events, many we’re familiar with through rodeos. And if you’re familiar with the sport of English Dressage, you can add Western Dressage to your vocabulary. It is a new and growing sport and there is a national organization supporting and teaching these methods of horsemanship. And then there are hard-core endurance events. 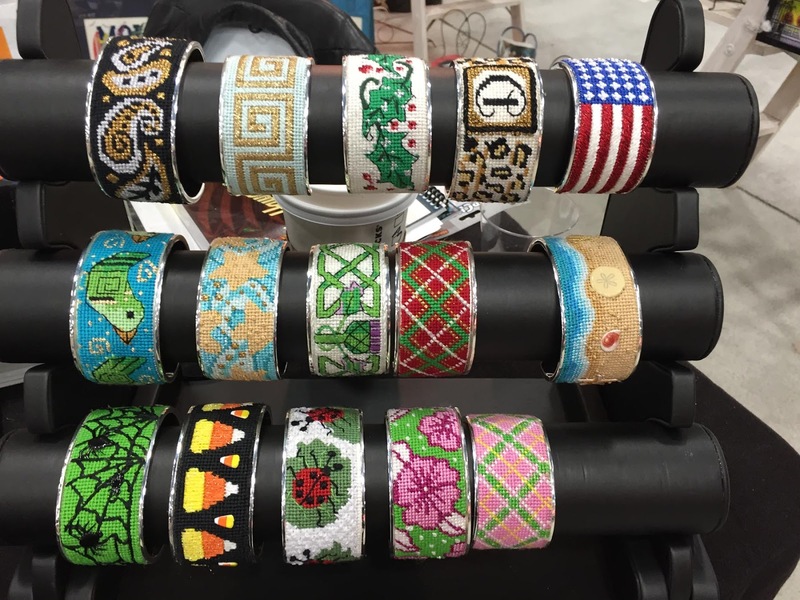 In all of these sports standing out with unique colorful western tack on your horse is one way to catch the judge’s eye. My best customer and friend, Shonna Shore, has opened a FaceBook page: Concho River Mohair Cinch Company. Her designs are phenomenal and she makes the best use of my array of colors. 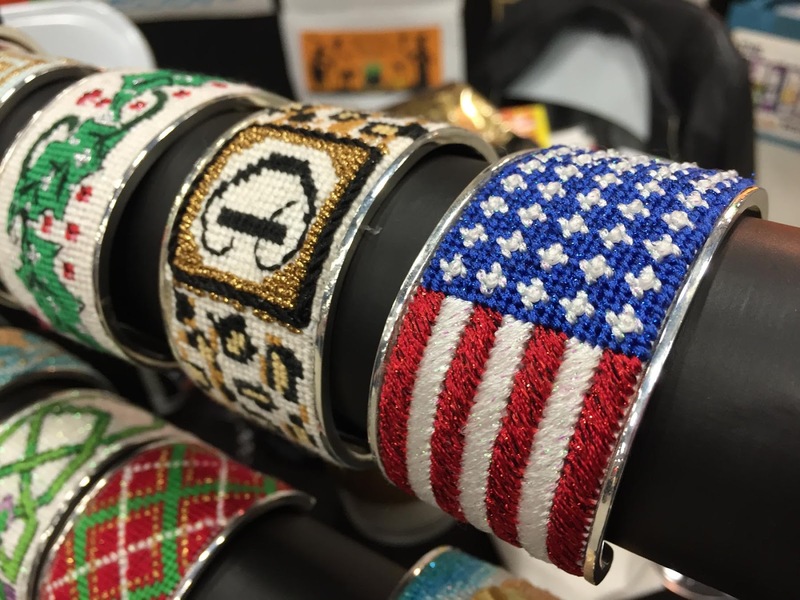 (See photos of some of Shona's cinches). I now have over 60 colors for the 2-ply cinch yarns. This is the yarn that is used to weave the design. I also create custom colors in the 8-ply cinch yarn—4 times the thickness of the 2-ply, this is the yarn that is the “warp” and runs from buckle-to-buckle. And I’m creating tie-dyed 8-ply and 2-ply in two, three or even four color combinations. 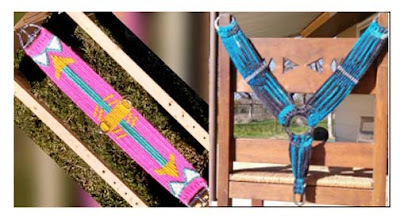 The picture of the Turquoise & Black horse breast collar depicts one of my tie-dyed pieces. Also woven by Shonna. Q: Do you make any other items? A: I’ve woven a bunch of belts, which are lingering in my new Etsy shop all alone. You’re more successful in selling when you have a variey and abundance of products in your shop. I’ve also made “mini cinch” keyrings with my 2ply scraps. And I’ve passed this “recipe” for making them onto the cinch makers to make as giveaways, gifts or to sell. I currently have a large weaving in progress combining the mohair with sari silk yarn & sari fabric yarn, this I plan on making into messenger bag flaps, bound with soft leather. Q: Do you sell at shows, galleries or online? A: currently sell only through my Etsy shop; Caravan Fiber. I am working on a 2nd Etsy shop—Caravan Emporium. I’ll be carrying something completely different in this shop—vintage accessory items for the boudoir such as 1920-1930 vanity lamps from Germany, which I am refurbishing, rewiring and making hand-sewn shades. Also vintage porcelain Little Lady powder boxes and trinket boxes, and luxe pillowcases of crepe-backed satin, hand-trimmed with lingerie laces—all very fem, very luxe. As you can tell—I’m always busy and always coming up with new ideas—so many it’s hard at times to keep up with all of my lines as well as maintain my farm and the animals every day. But somehow it all gets done. It’s a really good life. And I feel it’s also pretty well-rounded in creativity, helping my fellow artists, enjoying the outdoors and communing with animals. Do I miss city life? Yes, yes I do. And I’ll get back to visiting cities to enjoy the hustle, the inspiration that the diversity of the people and products offered, the restaurants and museums…the SHOPPING! I actually can’t wait until my animals don’t need me around so much. Until then, I’ve plenty to keep me busy. Introducing five new colors in Kreinik Japan #5, a smooth gimp you couch on fabric or canvas to resemble real metal embroidery. 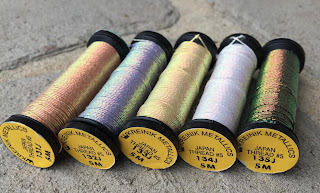 Japan threads are non-tarninshing options to more expensive real metal threads, and look elegant when used in surface design, needlepoint, even crochet. 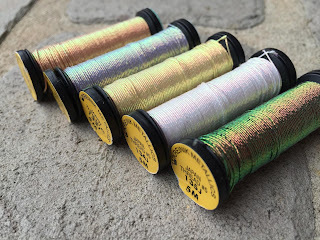 If using in needlepoint or surface embroidery and you want the Japan thread to be the main focus, couch with a clear monofilament thread, or a coordinating color of Kreinik Cord or Blending Filament. Japan color 134J Glacier, for instance, pairs with Kreinik Cord 032C. Japan color 133J Sunny matches Blending Filament color 091. If you want your couching stitches to be decorative, adding a layer of visual interest, you can couch the new Japan colors with any color of thin thread such as Kreinik Silk Bella, Silk Couching Thread, Cord, Japan #1 or Very Fine #4 Braid. If you've never tried couching, it's time to learn this versatile stitch. It enables you to use any fiber on any fabric or canvas because the fiber doesn't have to fit through any holes. Simply lay it on the top of your design, and tack down in side-to-side or decorative stitches. Plunge the ends to the back of your fabric/canvas and secure on the back with tacking stitches or running them beneath other stitches. Ask your favorite needlework store for the new Japan thread colors, or visit http://www.kreinik.com/shops/Japan-Thread-5-5m-spools.html for more information.